Known as the Gateway to the Costa Brava, Blanes boasts four kilometres of golden coastline in a glorious setting. Just 60Km from Barcelona airport, it’s easy to see why this fishing town remains a popular destination, all year-round choice for Spain holidays with locals and tourists. Holidays in Blanes tend to have a more relaxed feel than in some of its larger counterparts, making it fantastic for families. The combination of old world charm and modern convenience make this town idea for your Spain holiday. Blanes has its roots in the ship-building industry. Locals throng the historic centre for the markets, or to visit one of the 650 shops, including enough upscale boutiques to keep the keenest fashionista happy! One thing’s for sure; you don’t get cold on Costa Brava holidays. The region’s Mediterranean climate guarantees long hot summers, with average temperatures often reaching 30° Celsius in the summer, and frequently giving 12 hours of sunshine a day. But the hottest months of July and August are often tempered by coastal winds that are a welcome cooling factor if you are trying to work on your tan. For nature lovers, no holiday to Blanes is complete with a visit to the famous Botanical garden Marimultra, housing 4,000 plant species. Ancient sites of the old town include the palace of the Viscounts of Cabrera and the medieval castle of Sant Joan. For a great family day out on your Blanes holidays, try Europe’s biggest water park Water World, just up the road in Lloret de Mar, or South of Blanes is Marineland with dolphins, sea lion shows and a reptile house. The bustling daily farmers’ market sells fruit and vegetables on weekday mornings, while souvenirs, leather goods etc can be found at the Monday market. The town has fiestas throughout the year, the biggest of which is the Festa Major from 24 – 28th July. The streets become a riot of music, dancing and entertainment, but the highlight is the fireworks contest. Even by Spanish standards, it’s a sparkler of an occasion. But no matter whatever you get up to on your Blanes holidays, you’ll enjoy taking it easy in true, relaxed Spanish style! You won’t be bored after dark on your Blanes holidays! Choose from nearly 100 restaurants, from burger bars and cheap Chinese eateries to more upmarket establishments offering international fare and local dishes. Blanes is strongly geared to holidaymakers looking for fun, and this means traditional fiestas, folk dances and Spanish music, good news for those with a taste for different cultures. After dinner, music bars, half a dozen clubs, and hotels offer live entertainment in the summer. If you’re feeling lucky, there’s also a casino between Lloret de Mar and Blanes. 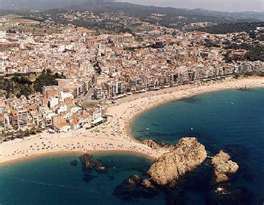 Blanes’ four kilometres of coastline means a variety beaches with everything from long, wide stretches of sand to small, secluded rocky coves. With enough space for everyone, beaches here are well-maintained, clean, safe, and have plenty of facilities for people on Blanes holidays. Join the locals for a stroll along the wide, palm-fringed promenade, watch the fishermen come in and the daily auction of their catch, or meander by the marina. For the best view in Blanes, climb the Sa Palomera promontory half way along the main beach. Book your Blanes Holiday now! Thoroughly Spanish, chilled out, welcoming, and perfect for families, Blanes holidays take some beating! on Nothern Holidays we has many fantastic deals on Hotels, accommodation and flights. Booking is easy just use our live booking system.